Heidelberger Druckmaschinen Aktiengesellschaft (Heidelberg) has been a major provider and partner for the global printing industry for many years. We offer our customers all necessary components essential to the success of their business activities in commercial and packaging printing. We develop and produce core technologies ourselves, while complementary components and technologies are provided to our customers via strategic partnerships. Our products, service offerings and consumables, as well as our partnerships, are tailored to meet specific future-oriented customer needs and are geared towards our customers' economic success. With our own sales and service branches and via partners, we supply our customers in around 170 countries worldwide with products, services and consumables, generating Group sales of around € 2.43 billion in the 2013 / 2014 year under review. Around 60 percent of sales were generated from new machinery; in addition to printing presses for sheetfed offset, digital and flexo printing, this includes prepress and finishing machinery and our software for integrating all of the processes within a print shop. In future, we intend to significantly expand our activities in the area of digital printing in particular, both within and outside our industry. 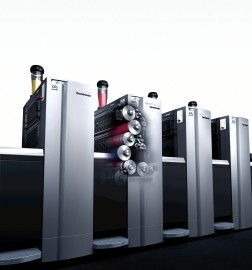 Heidelberg also has a substantial service volume. Around 40 percent of its sales are generated from services, consumables and service parts. Print shops have a continuous need for these products and services. Therefore, this segment is less susceptible to economic developments than the new machinery segment and provides a stable basis for our business activities. We also support our customers by offering financing concepts for their investment projects. All in all, some 12,500 people work for Heidelberg worldwide. In Germany, we are producing highly automated and more versatile high-tech machines according to customer requirements in all format classes offered by us. In Qingpu, near Shanghai, China, we manufacture high-quality preconfigured edition models. About 40 percent of our staff are engaged in production and assembly. Approximately 33 percent of our employees work in our global sales and service network. Reliable, rapid service is a key criterion for our customers when it comes to selecting a business partner. At the same time, this area offers attractive margins for Heidelberg. In the established industrialized nations and, increasingly, in the emerging economies, considerable emphasis is placed on the ecological optimization of the production of our machinery right through to operation and the consumables used. Measures relating to the development, manufacture and use of machinery are aimed at reducing resource consumption, and hence the carbon footprint, as well as other emissions and process-related waste. Our Anicolor printing presses make a significant contribution to reducing spoilage and hence paper consumption, the most important CO2-related parameter in the printing process. Our environmentally friendly consumables from the Saphira Eco line comply with the most stringent industry standards and statutory requirements. With our own sales and service branches and via partners, we supply our customers in around 170 countries worldwide with products, services and consumables, generating Group sales of around € 2.43 billion in the 2013/2014 year under review. Around 60 percent of sales were generated from new machinery; in addition to printing presses for sheetfed offset, digital and flexo printing, this includes prepress and finishing machinery and our software for integrating all of the processes within a print shop. Around 40 percent of its sales are generated from services, consumables and service parts.